So I was telling you that I did a lot of baking and I posted the Lemon Curd Tarts recipe here…Today, let’s see how you can make the best jam tarts ever!! 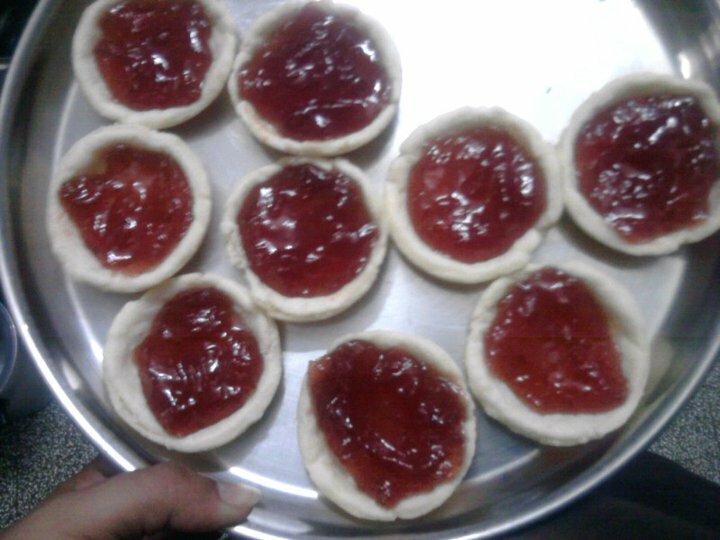 You can use any flavor of jam…I used a lovely Strawberry jam with real fruit pieces and cute little strawberry seeds My nephew loved these tarts!! Fill each cup 2/3rds with the jam. Distribute jam evenly in the cups. Bake in a hot oven at 205 degrees C (400 degrees F) for 15 to 20 minutes. When baked ( it should look lighter and will be solid not squishy) remove from patty tins and place on a plate to cool completely. You can pop them in the fridge for about half an hour and they’ll taste even better. Notes: This recipe is similar to the lemon curd tarts just that you bake these tarts with the jam filling in them The recipe was taken from The Thangam Philip Book of Baking. Wow… This looks soo easy.. Thanks for sharing this !! I wanted to look for craft shops in chennai and i got to ur site. Thanks for the info and then saw ur baking tutorials. I love baking and would like ur inputs on what OVEN to buy. Have u got a proper oven or a OTG? Please let me know. I returned home from overseas and not sure what to buy. Thanks again.